Our Baby First Aid and CPR course is one of the best things you can learn to look after your baby, aimed at teaching the basics of first aid how to manage an infant or toddler in an emergency situation, everyone is welcome including your baby! This short 60min workshop is easy to manage as you can bring your baby, friends, parents and hubby! We run this in conjunction with Gold Coast Active and Healthy for just $10 and its a must do introduction to baby CPR and first aid. Just book and turn up with your little one for this information workshop and we will look after the rest, morning tea, a beautiful new training room in Varsity, and of course all the information that could save your baby’s life! Bookings are essential as seats go quick! 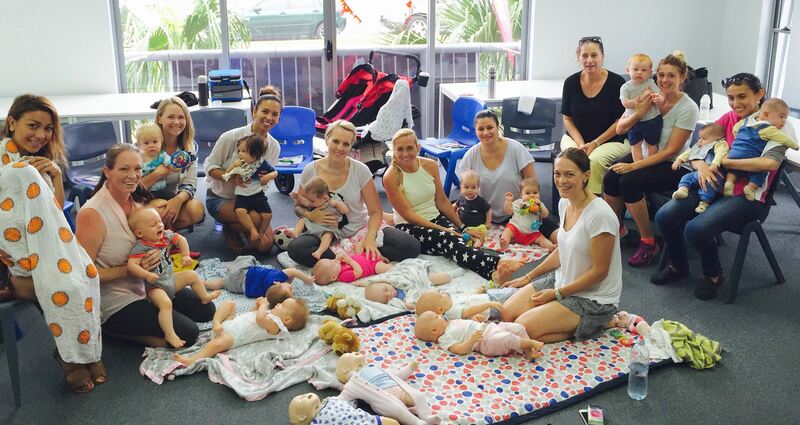 Mums and bubs practising Baby First Aid and Baby CPR skills in a face to face, fun and fully interactive setting. In this video, we discuss the Baby First Aid Course offered by the experienced instructors at First Aid Accident & Emergency. For further information on this course, please contact us today. In this video, learn all the basics on baby CPR, Baby choking, Febrile convulsions, bites and stings and burns. All mums, expecting Mums, Dads and carers should watch this video. This 1 hour Baby First Aid workshop is a must-do introduction to basic First Aid and CPR for babies. Mums, expecting Mums, Dads and anyone looking after your kids are all welcome. Bookings and prepayment are essential. Minimum number of participants required for session to go ahead. This information session is non-accredited, if you need to attain a First Aid qualification for the workplace or study please click here. Very helpful and not overwhelming. As a teacher and a mother it was invaluable.